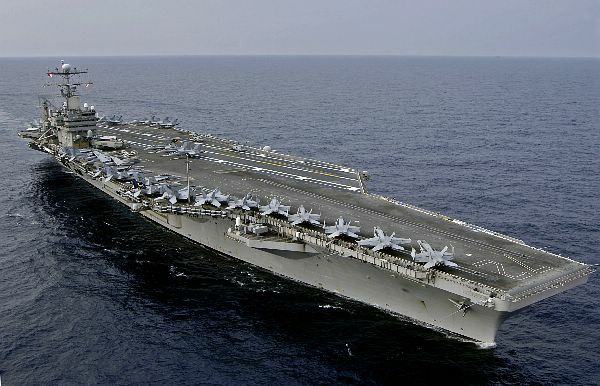 Atlantic Ocean (April 17, 2006) - The Nimitz-class aircraft carrier USS Dwight D. Eisenhower (CVN 69) transits the Atlantic Ocean. Eisenhower and embarked Carrier Air Wing Seven (CVW-7) are participating in Composite Training Unit Exercise (COMPTUEX). Red Sea (Nov. 3, 2006) — Explosive Ordnance Disposal 1st Class Christopher Courtney assigned to Explosive Ordnance Disposal Mobile Unit Six (EODMU-6), Det. 16 assist his team members during Special Purpose Insertion Extraction (SPIE) training from an SH-60 helicopter. 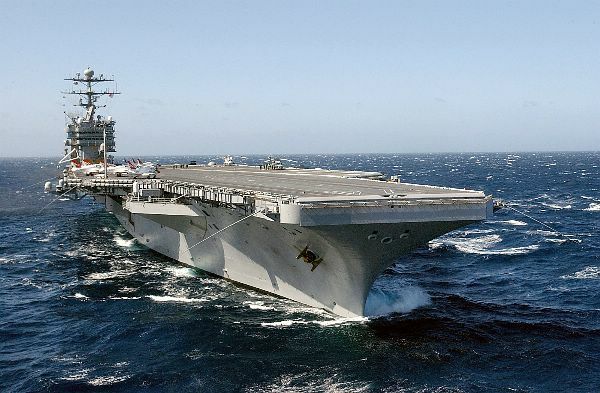 The Nimitz-class aircraft carrier USS Dwight D. Eisenhower (CVN 69) is deployed in support of Maritime Security Operations (MSO) and the global war on terrorism. Pacific Ocean (Jan. 4, 2006) - An SH-60F Seahawk assigned to the "Black Knights" of Helicopter Anti-submarine Squadron Four (HS-4) provides security alongside USS Ronald Reagan (CVN 76) as she departs her homeport at Naval Air Station North Island, and heads out to open sea. More than 5,500 Sailors from the Ronald Reagan Carrier Strike Group deployed today in support of the Global War on Terrorism and maritime security operations. This is the maiden deployment for the Navy's newest Nimitz-class nuclear powered aircraft carrier. 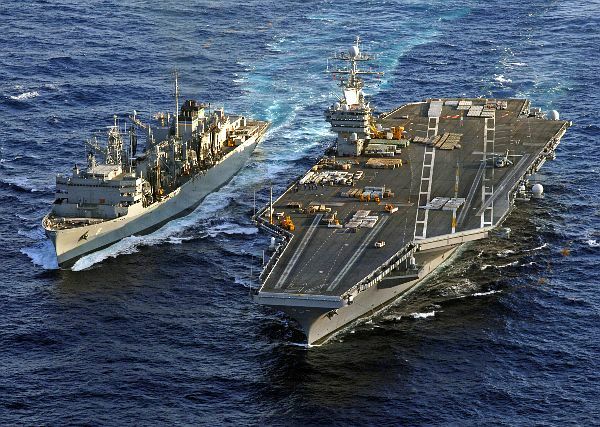 Arabian Gulf (May 20, 2006) - Military Sealift Command (MSC) fast combat support ship USNS Rainier (T-AOE 7), center, provides fuel for the Nimitz-class aircraft carrier USS Ronald Reagan (CVN 76) and the Arleigh Burke-class guided missile destroyer USS McCampbell (DDG 85). 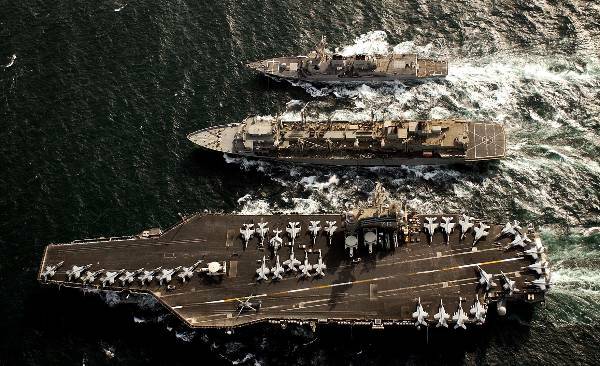 All three ships are part of the Ronald Reagan Carrier Strike Group, which is currently deployed as part of a routine rotation of U.S. maritime forces in support of Operations Iraqi Freedom and Enduring Freedom, as well as conducting Maritime Security Operations (MSO) in the region. MSO set the conditions for security and stability in the maritime environment as well as complement the counter-terrorism and security efforts in regional nations. MSO deny international terrorists use of the maritime environment as a venue for attack or to transport personnel, weapons, or other material. Pacific Ocean (Mar. 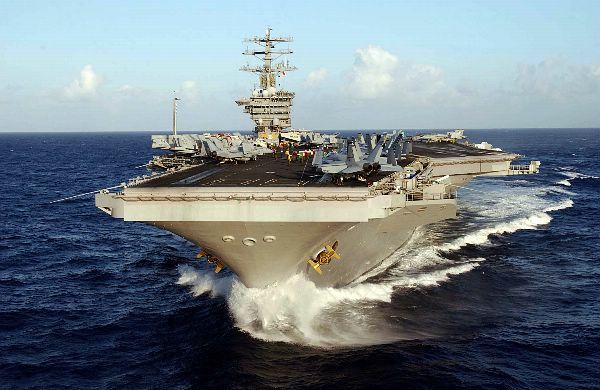 17, 2003) - USS John C. Stennis (CVN 74) steams off the coast of southern California. The ship is currently conducting pilot carrier qualifications with T-45 "Goshawk" aircraft. T-45's are used for intermediate and advanced portions of the Navy/Marine Corps pilot training programs for jet carrier aviation and tactical strike mission instruction. Initial carrier qualifications are normally conducted on an Atlantic-based carrier within close range of the Navy's Meridian, Miss. and Corpus Christi, Texas training facilities. However, the qualifications were moved to the Pacific since Stennis is one of the few carriers not deployed to regions of conflict. 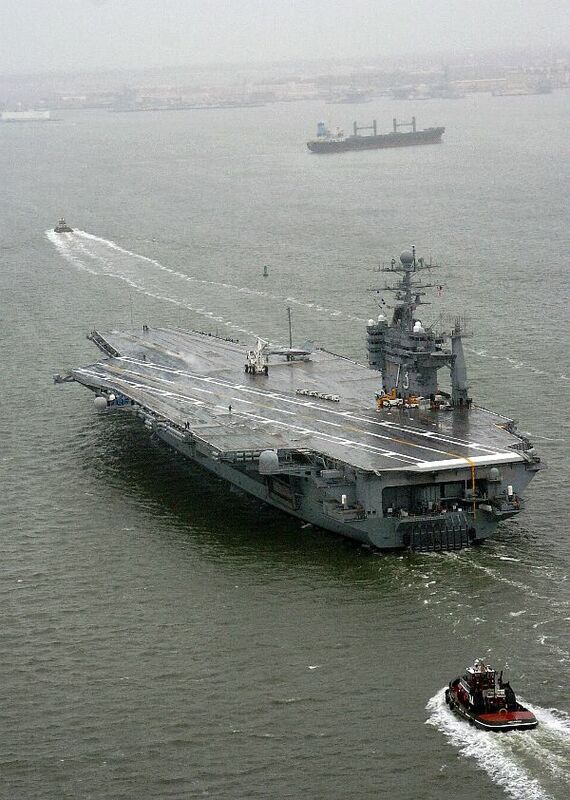 Newport News, Va. (Dec. 15, 2005) - The Nimitz-class aircraft carrier USS George Washington (CVN 73) leaves Northrop Grumman Newport News shipyard to conduct sea trials in the Atlantic Ocean. Carrier sea trials will help determine the ship's material readiness and ability to rejoin the fleet as a fully operational unit. Washington is scheduled to return to her homeport in Norfolk, Va., before the end of the year. 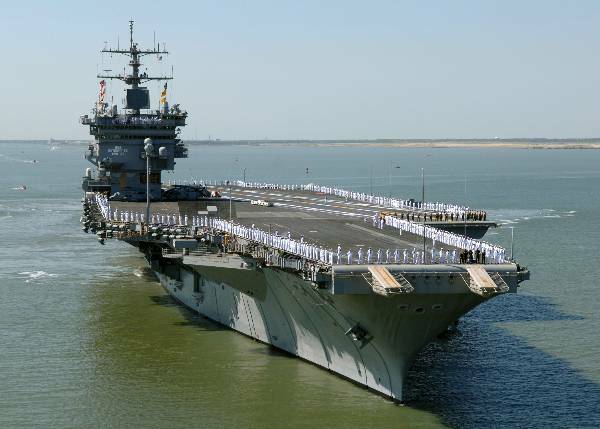 Norfolk, Va. (May 2, 2006) - The nuclear-powered aircraft carrier USS Enterprise (CVN 65) departs Naval Station Norfolk for a scheduled six-month deployment. Nearly 7,000 Sailors from the Enterprise Carrier Strike group are deploying in support of the global war on terrorism. 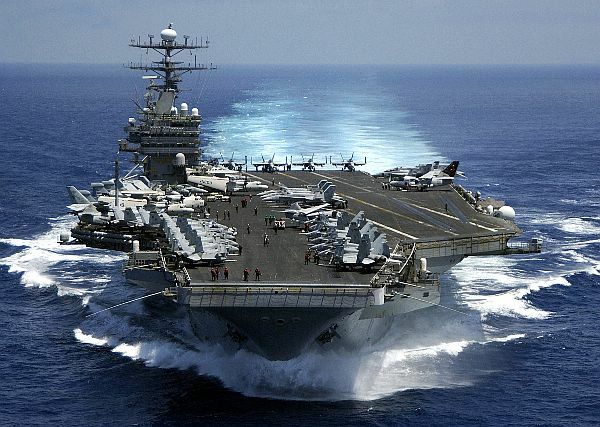 Atlantic Ocean (July 15, 2005) - The Nimitz-class aircraft carrier USS Theodore Roosevelt (CVN 71) underway in the Atlantic Ocean. The Roosevelt Carrier Strike Group is conducting Joint Task Force Exercise (JTFEX). 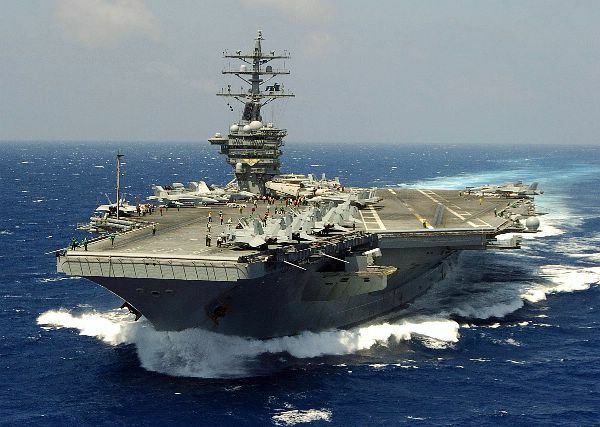 Pacific Ocean (July 25, 2005) – The Nimitz-class aircraft carrier USS Ronald Reagan (CVN 76) performs a high speed run during operations in the Pacific Ocean. Reagan and embarked Carrier Air Wing Fourteen (CVW-14) are currently underway conducting Tailored Ships Training Availability (TSTA). 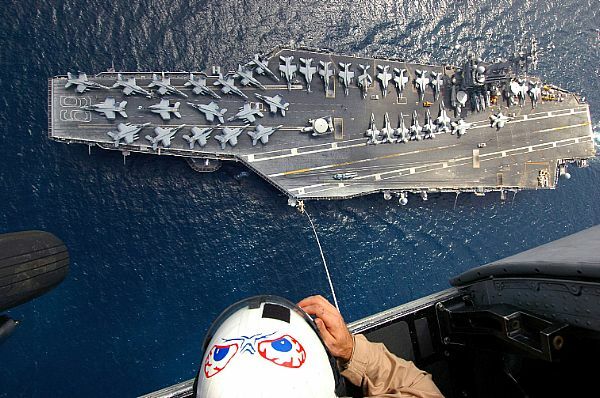 Pacific Ocean (Nov. 15, 2005) – Flying the First Navy Jack, the conventionally powered aircraft carrier USS Kitty Hawk (CV 63) prepares to conduct flight operations following a formation sail with ships From the Japan Maritime Self-Defense Force. The Kitty Hawk Carrier Strike Group is currently conducting the bilateral Annual Exercise 2005 (ANNUALEX) with Japan Maritime Self-Defense Force. ANNUALEX focuses on improving the military-to-military relationship between the U.S. and Japan. The purpose of ANNUALEX is to improve bilateral interoperability, defend Japan against maritime threats and to improve capability for surface warfare, air defense and undersea warfare. 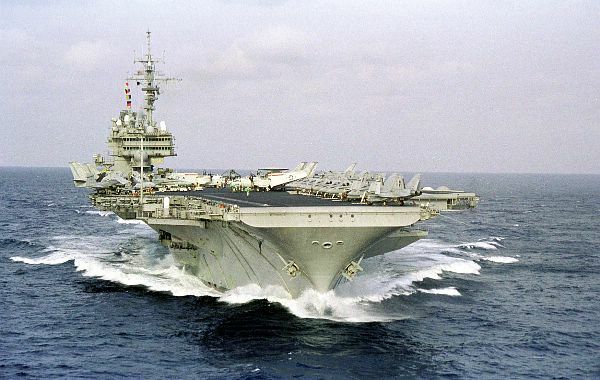 Pacific Ocean (Aug. 8, 1999) - USS Kitty Hawk (CV 63) is seen head-on at high speed during transit to her homeport of Yokosuka, Japan. Kitty Hawk is returning home after completing a six-month deployment to the Arabian Gulf in support of Operation Southern Watch. Atlantic Ocean (Nov. 3, 2005) - The Nimitz-class aircraft carrier USS Harry S. Truman (CVN 75) sails alongside the Military Sealift Command (MSC) fast combat support ship USNS Arctic (T-AOE 8 ) during an early morning Vertical Replenishment (VERTREP) and Underway Replenishment (UNREP). 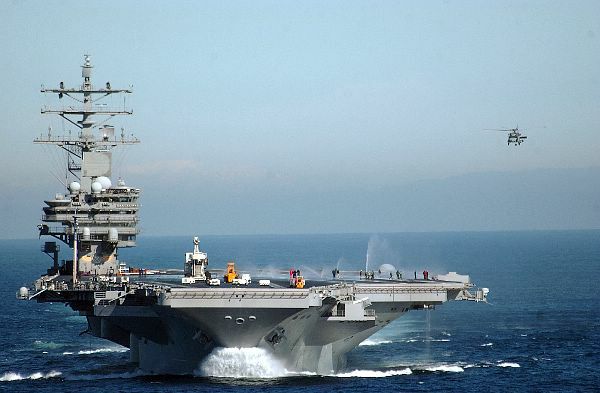 Truman is currently underway in the Atlantic Ocean conducting Ammunition Transfer with USS Enterprise (CVN 65) and USS Eisenhower (CVN 69). Pacific Ocean (March 23, 2006) - The Nimitz-class aircraft carrier USS Abraham Lincoln (CVN 72), and ships of the Japanese Maritime Self-Defense Force (JMSDF) conduct a PASSEX in the Western Pacific. Lincoln spent three days conducting exercises with JMDSF and took part in an officer exchange program as part of a passing exercise. Lincoln and Carrier Air Wing Two (CVW-2) are currently on a scheduled deployment to the Western Pacific. Indian Ocean (Mar. 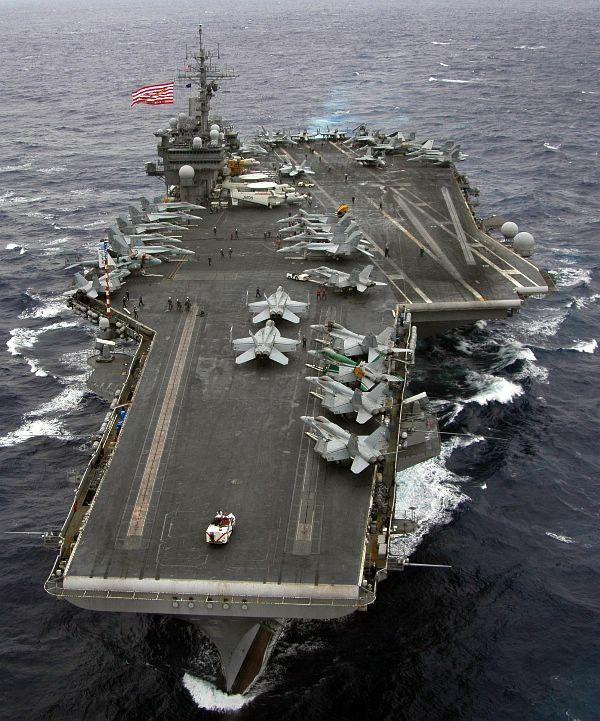 15, 2005) - The Nimitz-class aircraft carrier USS Carl Vinson (CVN 70) underway in the Indian Ocean prior to flight operations. The Carl Vinson Strike Group is currently on deployment to promote peace and stability and respond to emergent events overseas. USS Carl Vinson will end its deployment with a homeport shift to Norfolk, Va., and will conduct a three-year refuel and complex overhaul. 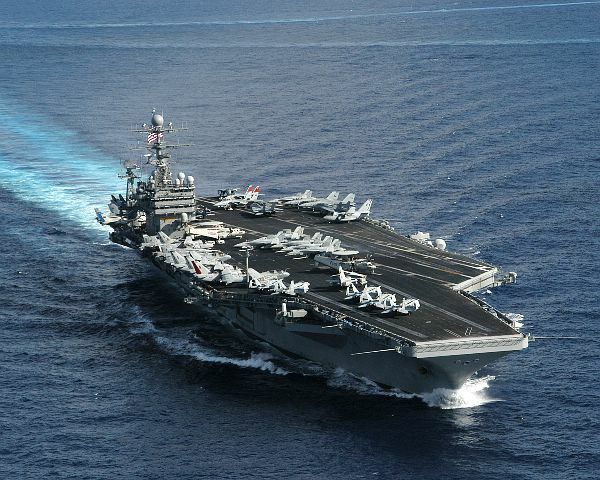 Pacific Ocean (May 15, 2005) - The nuclear powered aircraft carrier USS Nimitz (CVN 68 ) underway off the coast of Hawaii in the Pacific Ocean. The Nimitz Carrier Strike Group is currently on a regularly scheduled deployment in support of the global war on terrorism.